I’ll be honest — I’m not a fan of the DeKalb Market food hall. I think it’s too crowded, too loud, and too expensive — I guess I really am getting cranky in my old age. But I was excited to hear that a branch of Philadelphia’s Han Dynasty would be opening there. I enjoyed my meal (several years ago) at their East Village location, and I was glad to hear they were coming to Brooklyn. I went with some friends during their soft opening a few months ago, and made a return visit now that they’ve been up and running for a while. Some of the menu is hit-or-miss, but when it’s good it’s really really good. The entree section has a list of different styles, and you can choose which protein you want to be cooked in that style. Not all of them offer tofu, but enough of them do that there are enough vegetarian options to warrant repeat visits. 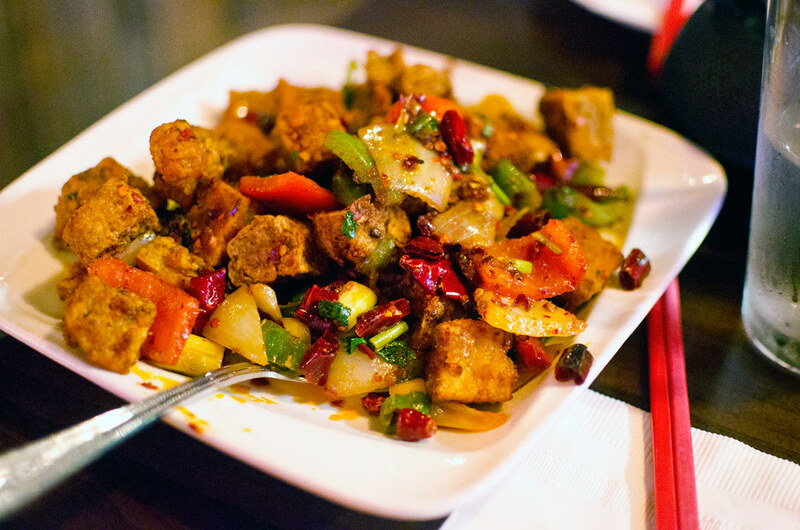 I chose to have my tofu Cumin Style — fried with a cumin crust and stir-fried with onions and hot peppers. I’d only ever seen this preparation with lamb, so I was excited to try the tofu version. It was everything I was hoping for: crunchy, aromatic, well-seasoned, and spicy enough to make my nose run a little. That’s a level 7 spicy at Han Dynasty; some of the dishes, like the cold sesame noodles, have no spice at all but others go all the way up to a level 10 (you can also ask them to adjust the spice level if you can’t handle it). We found the Scallion Style tofu (zero spice) to be a little bland, but the spicy crispy cucumbers (level 7) were good and definitely lived up to their name. Han Dynasty is a good enough reason for me to brave the nonsense of DeKalb Market, and there are so many other styles I haven’t tried yet. This entry was posted in downtown brooklyn and tagged chinese, dekalb market, downtown, han dynasty, vegan. Bookmark the permalink.